Note: Price is for one boot cover per package. Our cover is a universal design that will fit most brands of CAM medical boots on the market. If there is any question as to whether it will work for your particular boot, please contact our office and we would be happy to help. Measure the bottom of your medical boot from heel to toe and refer to the size chart below. 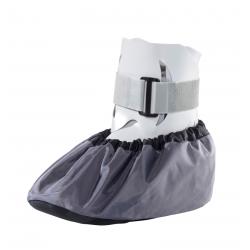 Our shoe and boot covers are available in four sizes to ensure a proper fit. If you would like assistance with sizing, please contact our office at 1-800-978-1786.